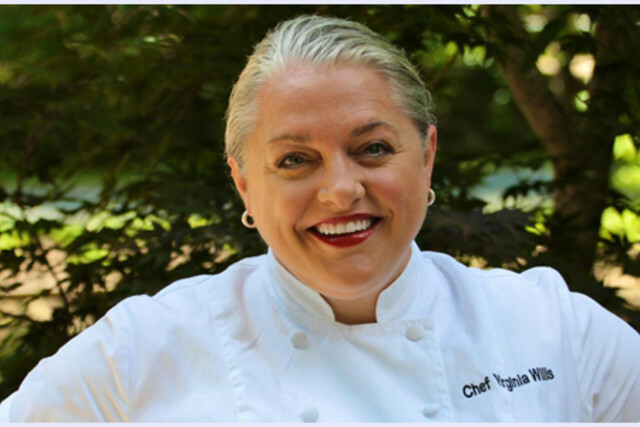 We feel honored to be able to present to you a dish from legendary Southern chef, Virginia Willis. Virginia is the author of "Lighten Up, Y'all," "Bon Appétit, Y'all," "Basic to Brilliant, Y'all," "Okra: A Savor the South Cookbook" and "Grits." The Chicago Tribune praised her as one of "Seven Food Writers You Need to Know." Her legion of fans love her knack for giving classic French cooking a down-home feel and reimagining Southern recipes en Français. She is currently in development with WGBH for a series called "Secrets of the Southern Table: A Food Lover’s Tour of the Global South" to air nationally on public television stations. Because this dish shows a lighter method for preparing a typically more fatty dish, we call it a Healthy Choice. A Seasonal Menu offering, Virginia Willis' Smothered & Covered Chicken with Herb Grits and Celery Salad will be available through mid­ April. Hear our interview with Virginia below! Why did you select this particular recipe as your PeachDish? What’s your ‘guilty pleasure’ food? What was it like to work with Julia Child?